There are things out there we naturally associate with one another, such as peanut butter and jelly or Starsky and Hutch. But our human curiosity is naturally aroused when we witness an unlikely match, something so “out of the box” it deserves to be explored. It is with this sort of inquisitiveness that British director Stephen Walker decided to embark on a trip to follow a chorus group from Northampton, Massachusetts. Their average age is 80 and their combined age is over 1000. “What is so special about that?” you may ask. They cover songs from Radiocast, Jimmy Hendrix, Talking Heads and James Brown, just to name a few. They call themselves Young @ Heart and that they are. You know you are about to witness something unique when an old woman with a cane inches her way to a microphone at the edge of a stage. After a moment of silence she screams and then begins something the younger generation can unmistakably recognize as “Should I Stay or Should I Go” by The Clash. Pretty soon, the drums and electric guitar are backing her up, as well as the 23 other members of Young @ Heart. The film follows the group for a 7-week long rehearsal period, to prepare for their new program “Alive and Well”. On the first day of rehearsal, chorus director Bob Cilman has some new tricks in his pocket. Sonic Youth’s “Schizophrenia” is the first he whips out. The classical music and opera lovers in the room resist the charm of the recording Cilman imposes on them. For some, hearing aids must undoubtedly be ringing while others improvise ear plugs out of tissue paper. James Brown’s “I Feel Good” is much better received and described as having “some juice”, but the honeymoon is soon over when the director presents “Yes We Can, Can”. The tune will be a challenge for the aging memories. The word can appears no less than 71 times in the tongue twisting fast paced song. All that said, one might wonder why these culture vulture seniors are out singing punk songs. “I’m trying to expend my horizon” one says, “it’s got a lot of life, that’s what we have: a lot of life!” blasts another. And it’s no secret that “singing does a lot for your whole body.” When you get old enough that your age becomes a bragging right, nurturing your body and soul is a matter of survival, especially when chances of seeing your peers pass away become higher each day. This reality is ever present in the group. “If I collapse on stage, just drag me off and go on” announces a chorus member. This feeling is shared by all. The spirit of these folks is remarkable. They embrace every challenge and there are many for a generation that didn’t grow up in today’s technology dependent world. Things that might seem second nature for the baby boomers are not so obvious when your age is nearing the triple digits. When Bob Cilman gives a practice CD to two selected soloists for “Life During War Time” (Talking Heads), he is met by a long moment of silence, during which the elderly couple looks at the little silver circle and turns it every which way. Then one of them ventures: “Is that the side that plays”? 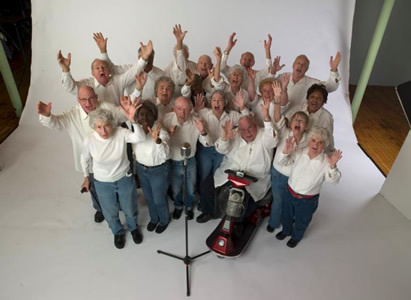 Life is what you make of it and the Young @ Heart chorus has chosen to rock ‘til they drop. This amazing documentary is a testament to the courage of getting older. It will take you on a journey through life and death and everything in between. Be prepared for the laughter and the tears it will induce. This is a not to be missed movie!